So is the problem in the system and you can't really do anything about it right now? 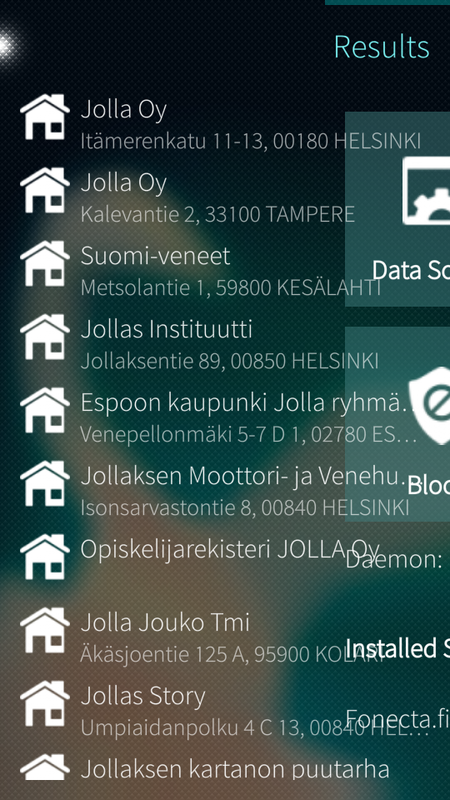 I got some tips from CodeRUS and now Phonehook 0.6.3 should run ok on Sailfish 2.1. I more or less just needed to build the app with the preview SDK. Thanks. Though the translation files seem to be missing. When that issue gets fixed I will release an updated build. Yes, it's working again. Thank you so much. Hi, I've noticed that this happens when you get logged out for some reason, and logging back in usually fixes it for a while. I'd recommend trying the "Truecaller App" source that's been recently added, that should work more reliably. For PagineBianche.it (Business), the app doesn't add the phone number to Contacts, only the address...is it a known bug? In version 0.6.2-2 Russian language appeared. Thank you. В версии 0.6.2-2 появился русский язык. Спасибо. Seems that the Finnish translation had the wrong encoding, which caused the build to skip all of the translations. I've uploaded 0.6.2-2 which fixes that and some other minor issues. Are you sure you are using the latest version? They show up for me when I switch to Russian. In Sailfish 1.1.9.28 when you search something you can see half of the main page in the background. There might be some other places that this happen. Like when you add new service if I remember correctly. Weird, I'm running 1.1.9.28, but I have never seen that occur. Does it happen every time? Yes it does happen every time. I have only used Fonecta so I don't know how it behaves in other services. Edit: If I press search it works ok but if I swipe then this happens. Yeah now I see it, I usually always press Search when I do searches, which is why it never happens for me. I wonder if I'm doing something wrong in the app or if it's a Sailfish issue with swiping dialog windows. I'll do some research when I get the time. Hi! I have added paginebianche.it as a data source now, so you can check that one out. Generally the advice is to use the global directories if no specific ones are available to your country, and since laws and such differ between countries, that may sometimes be the only choice. Will you be making a version for 1.1.9, or 2.0? If there are any issues that needs to be fixed then I will make a new version. I'm currently running 1.1.9.28 on my phone, and everything still seems to be working. If you find anything, please let me know. hey man! thanks for great app! Thanks for the suggestion, I will add it to my list and see if I can work it into a coming version. Thank you for this app, it's great!! I had a look at that site, but I can't find a way to do lookups for numbers, only search for names. The name search also requires that you specify the region you want to search in. If you find a site where you can enter numbers and get names, let me know and I can try to work with it. I've tried adding the two new sites you listed, they should be visible in the app now. The site paginasamarillas.es requires some changes to the app (dropdown select of regions) before I can make a search function for it.